RainSaucers is all about enabling free standing rain barrels with an emphasis on water quality- it's why we use food grade plastic for our catchment. We're not necessarily against using the roof, its just that we think roof runoff is best suited to lawns and non-edible plants. Yet even though we're not specifically designed for roof catchment we've had many people say a RainSaucer is an ideal way to harvest water off structures with no gutters. 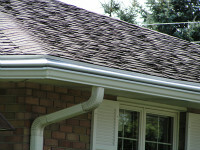 And when you think of the hassle and expense of gutter installation, a single RainSaucer represents a legitimate alternative. - Poor family homes in much of the developing world.